The unemployment figures make for harsh reading. According to New Economy, the Manchester agency tasked with promoting economic activity, the rise recently has been especially harsh in the young. "The number of jobseeker’s allowance (JSA) claimants in Greater Manchester grew by 1,170 and was recorded at 82,310 in September 2011 – a monthly rise of 1.4%. National and regional JSA numbers also increased from August to September – by 0.2% and 1.4% respectively." To bring home the human side of it, there's a journalist of my vague acquaintance - Nick Hyde - who has joined those ranks. I don't know him well, but he's written a calm and collected blog about it, here, which has taken some guts. I detect too that he's got a few irons in the fire. More and more the self-employment and start-up business route is appealing to people like Nick. Not just to those who have had unemployment forced upon them, but for those for whom grinding away at the same thing just doesn't seem worth it any more. A venture capitalist of this parish, Richard Young, is even looking for experienced managers to back in start-ups, something many private equity and venture funds seemed to have given up on a long time ago. He's come up with the phrase "management breakout" and I wrote a bit about it here. I tend to squirm at some of the rhetoric around start-ups and new business. There is a tendency to make a serious endeavour into something like the Apprentice or the X Factor, but there is an opportunity here for investors even if banks aren't there as they should be. 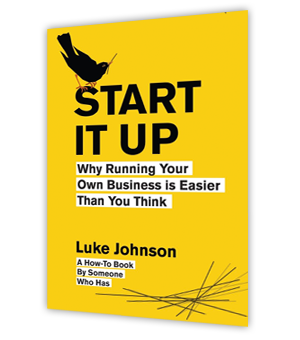 Much as I'm sure the likes of Nick want to avoid hanging round the house reading books, I can heartily recommend a great new title by Luke Johnson. Start It Up - why running your own business is easier than you think reads like a real go-to-it guide for anyone thinking of making a leap on their own. Plenty of people dream, but few take the plunge to do it for themselves. There are inspirational stories of people who made the leap, but also useful pointers on what to avoid and what not to do. It's also rare for a business book in that it's very well written. I've always had a massive admiration for the self-employed. Walking around the streets of Marple early in the morning, while walking the dog, I see plenty of them getting into their vans and setting off on jobs as plasterers, window fitters and builders, etc. This is the army of hard working grafters that keep the economy ticking along. My Dad was a self-employed milkman until he sold up last year, though we made sacrifices as a family, that independence of spirit and that control over his own destiny was a freedom he loved and gave him the chance to diversify with his farm. The economy is dreadful, there is clearly less money around, but I think there is a boldness and a zeal out there. People will struggle, they will be hungry, but they will also get up, attack the day and try and make the best of things. They are the true heroes - you hear politicians pay lip service to them, but I really wish the media would recognise this growing movement. They need all the encouragement they can get.